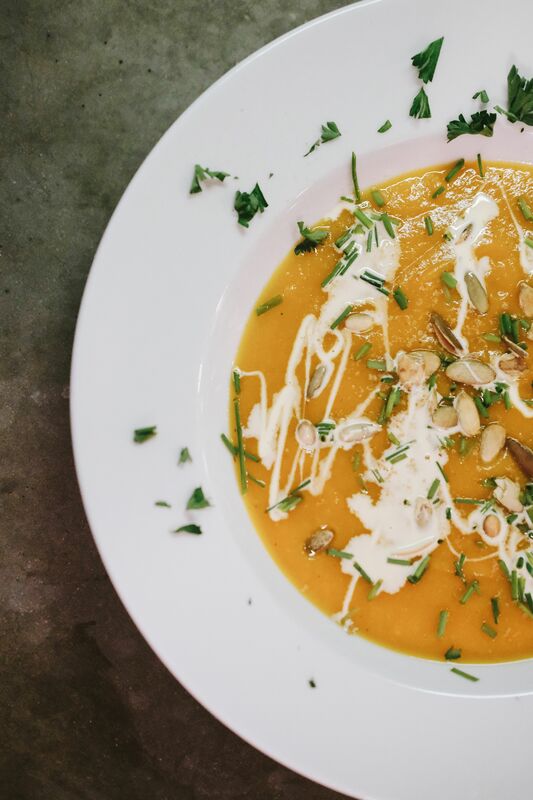 I like to make this Butternut Squash soup fairly often in the fall and winter, its a great way to get in lots of veggies and it’s not overly heavy at all! This recipe is so easy to make and freezes very well if you wanted to make a big batch and have more another time. To be honest though, the toppings are my favorite part of this soup, they are so delicious! When you put them all together they are the perfect fall flavors! I just listed a few of my favorites but you could also top with goat cheese, crushed cashews or scallions. Enjoy this easy, delicious and healthy soup recipe! 2. Drizzle Olive oil over the top of squash halves and sprinkle with salt and pepper. Roast in 400-degree oven for 25 to 30 minutes or until desired tenderness. 3. While squash is roasting, melt butter in a small dutch oven and saute shallots over low heat to caramelize. Add in ginger and garlic and saute for an additional minute. 4. Remove squash from oven and scoop out flesh and put in blender. Add the sauteed vegetables and process slowly adding chicken stock. 5. Pour contents from the blender into a dutch oven. Add salt and pepper to taste. Add in nutmeg and taste. Reheat and serve with toppings. 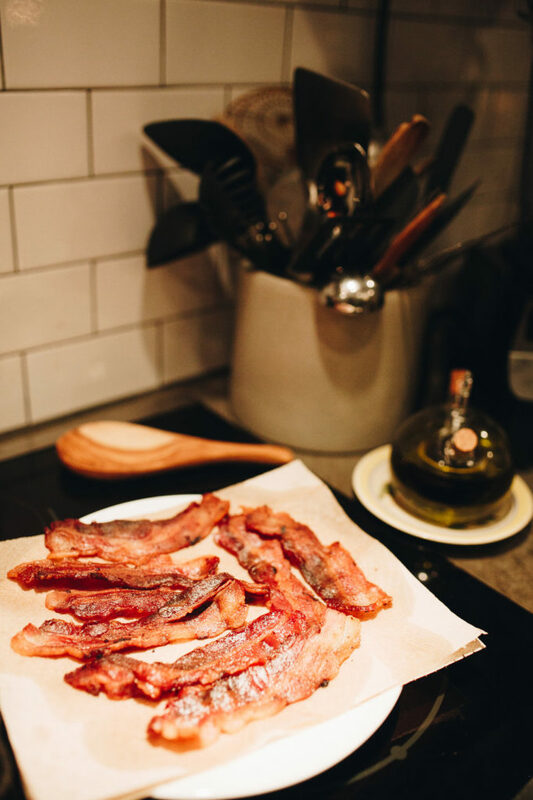 Bacon: Cut up bacon into 1-inch pieces and saute until brown and crispy. Fried Sage leaves: Put a ½ inch of avocado or coconut oil into a small saute pan. Heat oil on medium-high heat till you see the top of the oil glisten. Add 6-8 sage leaves and fry for 2-3 seconds until crispy. Drain on paper towel. Toasted Pepitas: Drain oil from saute pan after frying sage leaves, leaving very little oil on the bottom of the pan. Add ¼ cup of pumpkin seeds and over medium heat, toast until golden. Fried sage leaves Put a ½ inch of avocado or coconut oil into a small saute pan. Heat oil on medium-high heat till you see the top of the oil glisten. Add 6-8 sage leaves and fry for 2-3 seconds until crispy. Drain on paper towel. Toasted pumpkin seeds Drain oil from saute pan after frying sage leaves, leaving very little oil on the bottom of the pan. Add ¼ cup of pumpkin seeds and over medium heat, toast until golden. Drizzle Olive oil over the top of squash halves and sprinkle with salt and pepper. Roast in 400-degree oven for 25 to 30 minutes or until desired tenderness. While squash is roasting, melt butter in a small dutch oven and saute shallots over low heat to caramelize. Add in ginger and garlic and saute for an additional minute. Remove squash from oven and scoop out flesh and put in blender. Add the sauteed vegetables and process slowly adding chicken stock. Pour contents from the blender into a dutch oven. Add salt and pepper to taste. Add in nutmeg and taste. Reheat and serve with toppings.